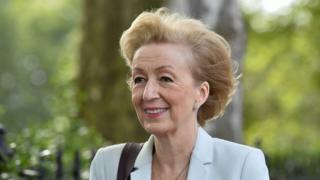 Image caption Mrs Leadsom called the letter "despicable" and said the sender was a "coward"
A death threat sent to Commons leader Andrea Leadsom is being investigated by the Metropolitan Police. The senior Conservative minister, and MP for South Northamptonshire, campaigned for the leave campaign in the 2016 European Union referendum. The letter, which Mrs Leadsom posted on Twitter on Monday, read: "If you attempt to take away part of someone's identity, there are consequences." Mrs Leadsom said it was "despicable" and called the sender a "coward". The letter, signed by "the real 48 per cent", is similar to threats received by other Brexit supporters, including a constituent of Tory MP Zac Goldsmith earlier this month. It goes on to say: "You have taken lives on our side. Now we will take lives on yours," before signing off by saying "we are coming for you." A Metropolitan Police spokesman said: "Police are aware of threatening letters sent to four Members of Parliament at the House of Commons. "Two of the letters were reported to police on 9 February, and two on 12 February. "The letters are being investigated by officers from the Parliamentary Liaison and Investigation Team within the Parliamentary and Diplomatic Protection Command. What next for Brexit in 2018?